Though bamboo is a very resilient and strong material, it is fragile as well. One hard knock, a little rough treatment and there is a danger of your Bansuri developing a crack. There a couple of maintenance tips you can follow to ensure a long and mellifluous life of your Bansuri. These tips apply to my other flutes like Carnatic and World flutes also. Protect your Bansuri from Shocks: Thermal and Physical The main way in which bamboo flutes fail is through cracking. Bamboo flute's body is composed of thousands of longitudinal fibers running across the length of the bamboo. A little crack at one point may not take much to propagate along the whole length. Cracks are caused more often than not by exposure to extreme temperatures, humidity & hard knocks. Avoid playing in cold ambient conditions. Warm breath going in to the bore will rapidly expand the insides with the outer surface remaining cold and un-expanded, leading to the possibility of developing a crack. Avoid exposure to extremes of temperatures. Before playing, always bring your bansuri to room temperature. This is especially important when the bansuri was, say, carried from cold outdoors to warm indoors. 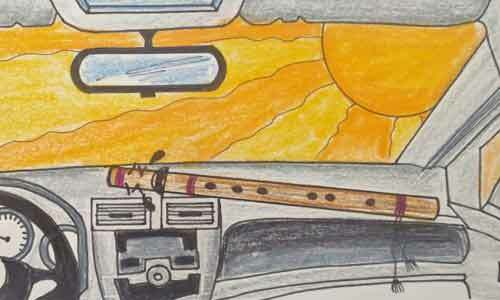 Also, very important to remember to not leave a bansuri in a hot car for extended periods. Wipe the bore dry after a playing session. This is especially important in cooler climates because of excessive formation of condensate. Store your frequently played flute/s in a vertical position with the head up. Say, in a tall basket. This helps drain down any moisture built up and help prevent accumulation of moisture which can lead to localized swelling of bamboo and possible eventual cracking. 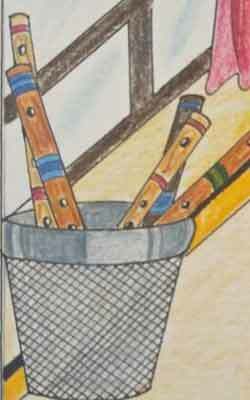 If a basket is not handy, you can even stand the flute against a corner. Do not put the flute in a case or a flute bag while it is drying because that can lead to growth of mold. Take care not to knock or drop your Bansuri against any hard surface as bamboo, though being a very resilient and strong material, is susceptible to developing cracks due to its low thickness and unidirectional fiber orientation. Fix the thread binding promptlyEnsure that your Bansuri is protected by thread bindings at both the ends, and in the middle portion. Take note of where the bindings are originally provided. Bindings are vital for a long and healthy life of your bamboo flute. if you ever notice them coming undone, thread it again or if you can't, apply 4-5 moderately tight rounds of adhesive tape around in place of the lost threading until you can bind them properly with thread. Never leave your Bansuri laying around on the floor. The foot that tramples on it may be your own! Another common hazardous situation is when you are taking the flute out from your car with one hand and slamming the door shut with the other. 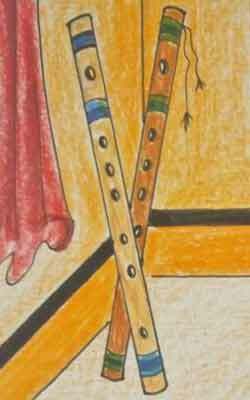 The end of the bansuri may get caught in the door. Believe it, many a flutes have been crushed in car doors! Illustrations by Aruja Verma, Amity School of Design, Noida, India. In the long run, oiling helps to protect the bansuri against the effects of repeated moisture and humidity fluctuation. 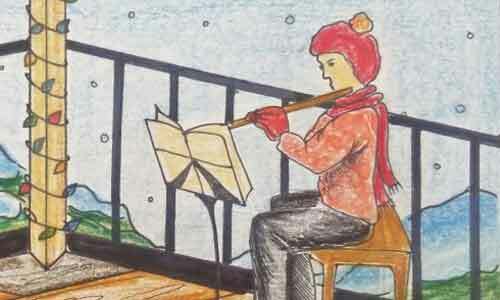 Oil, preferably Mustard oil, should be applied to the inside of the flute and to the point just below the blow-hole. To apply oil to the interior, some sort of home-made swabbing device may be employed to reach up into the bore. Example: A swab of oil-saturated (but not dripping) cloth is tied/fastened to an ordinary wooden dowel. Alternatively, use a venetian blinds wand. It is usually 3 feet long and has an eyelet at one end through which you can pass a strip of cloth. Extra length of the cloth can be held down with a rubber band. Oil your new bansuri the first time after about first 15 days of playing (if you're playing moderately, say, up to half an hour a day). If you are playing for longer duration than this in the beginning, it would be advisable to oil it sooner. Say, 4-7 days. Preferably use Mustard or Walnut oil. You can mix in a little bit of high potency vitamin E oil with the oil to retard the tendency to go rancid. Oiling swab should be loose fitting and should not have to be forced in the bore of the flute. Apply oil only up to the blowing hole, not further. Do not oil a 'wet' (freshly played) bansuri. Allow the bore surface to be dry. Oiling every couple of months or so is generally quite adequate. Despite all TLC (tender loving care) bansuri bamboo can still develop a crack sometimes. Even though, at first the crack may not seem to affect the sound at all, the crack can propagate quickly and diminish the quality of sound. So the best course of action would be to repair and control the crack at the earliest. 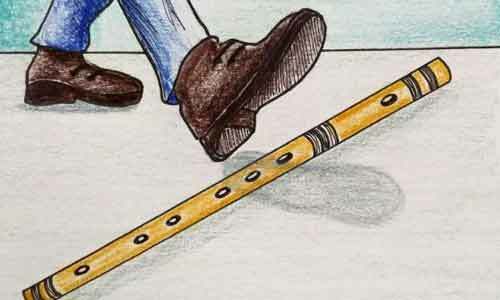 Take the bansuri when its cold (not recently played) and apply low viscosity cynoacrylate (instant glue) along the crack...it should seep into the crack because of low viscosity and create a seal. Hold the flute and press so that the crack is closed... hold for about 30 second. Then, after 5 minutes or so clean off extra glue from the surface and do thread binding if you know how to do it or apply several rounds of scotch tape. Here's a video showing in detail how to put thread bindings on your bansuri.